I was already aware that when making changes to the website it is always sensible to talk to people across the business to make sure they are aware. For instance you want Customer Services to be aware so that if they suddenly start getting calls about an issue they will firstly let us know as soon as possible, and secondly know what has changed so they can help customers. But when I tweeted last week it did not occur to me that I should once again be warning Customer Services and the Social Media team. With one week to go in our second set of tree jacks I wanted to encourage some last minute completions, just to boost our numbers a bit. 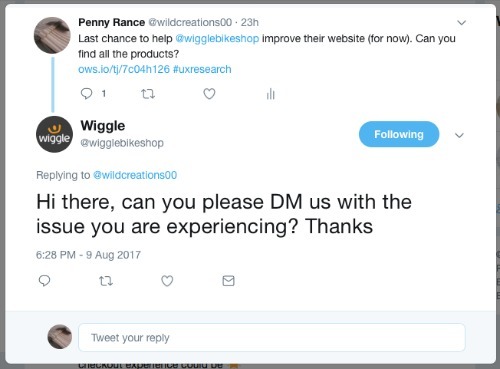 I had already posted the links out all across my personal social media (thanks if you completed them for me) having been told that the Wiggle Social Media team could not help us promote our research across the business accounts at this time, but this time on twitter I included @wigglebikeshop. 8 hours after I had tweeted Wiggle tweeted me back. I assume this is the standard response from Customer Services, but because the tweet was not signed off I did not know who to talk to about it. I DM (direct messaged) them to explain who I was and as I was there ask for a retweet. I heard no more and forgot about it, until Friday when I got a notification on my phone to say my message had been retweeted. Not good - the link no longer worked as I had turned the tree jacks off that morning!! I DM'ed again asking for the retweet to be removed but did not hold up much hope based on the past experience. Did I need to worry? Five minutes later I had someone replying to say the link did not work. Again I have no idea who retweeted my tweet, so I ran down to Customer Services where someone helped me to finally remove the retweet. At least no more customers come across it but I am disappointed with the whole experience. Think how many more people we could have had complete the tree jack if it had been retweeted in good time! So the lesson here? If I had spoken to the teams involved, maybe I would have got a retweet when I needed it and maybe I would not have had to run around trying to fix things last thing on a Friday afternoon. Always look at the bigger picture and the consequences of what you are going to do.